“It’s a big, elliptical hole in the ground, so the extra weight must be hiding somewhere beneath the surface. And an ocean is a natural way to get that,” said Francis Nimmo, professor of Earth and planetary sciences at UC Santa Cruz and first author of a paper on the new findings published November 16 in Nature. Another paper in the same issue, led by James Keane at the University of Arizona, also argues for reorientation and points to fractures on Pluto as evidence that this happened. 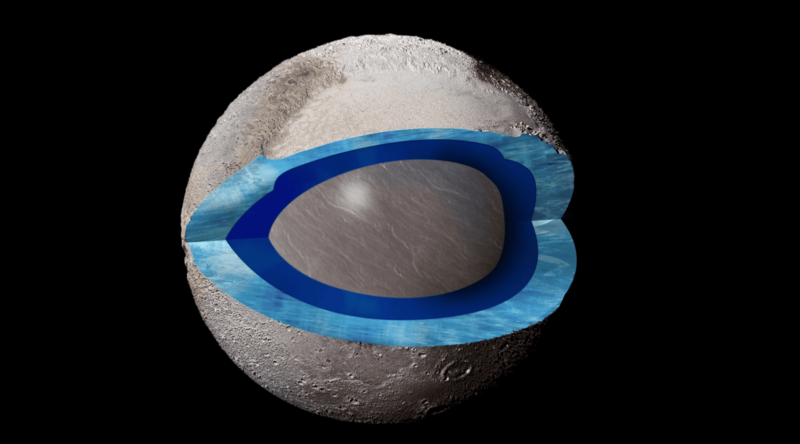 Nimmo and his colleages also considered whether the extra mass could be provided by just a deep crater filled with nitrogen ice, with no upwelling of a subsurface ocean. But their calculations showed that this would require an implausibly deep layer of nitrogen, more than 25 miles (40 kilometers) thick. They found that a nitrogen layer about 4 miles (7 km) thick above a subsurface ocean provides enough mass to create a “positive gravity anomaly” consistent with the observations.